Red-eared sliders aren't the smallest of the popular pet turtles. Even the smallest pet turtle needs plenty of space for swimming and basking. The smaller the turtle, however, the less space it needs to be healthy and happy. Many pet stores and reptile dealers sell turtles that start out small, at only about 4 inches across, but quickly outgrow their tank. At 5 inches or less, mud turtles are among the smallest turtles kept as pets. Aptly named, these turtles bury themselves deep in the mud throughout the winter months and emerge when warmer weather returns. Mud turtles have minimal care requirements, although housing with both clean water and dry land is necessary. If cared for properly, they can live to be up to 50 years old. Mud turtles can emit a foul odor if threatened, but this is generally not a problem in captivity. Commonly called stinkpot turtles, musk turtles get their name from the strong smell they emit when frightened or attacked. They are closely related to mud turtles, and grow only to about 5 inches across, which means a single musk turtle can be housed in a 20-gallon tank, or a pair in a 30-gallon tank. Stinkpots require water deep enough to swim in and prefer a place to hide in the water among branches or rocks. They also need a small basking area out of the water. Slider-type turtles, including the red-eared slider, painted and map turtles, are slightly larger than mud and musk turtles. These turtles owe much of their popularity to their bright coloring and interesting shells. Sliders can reach up to 16 inches long, which is large compared to mud and musk turtles, but small compared to their seafaring relatives who frequently reach 5 feet long. 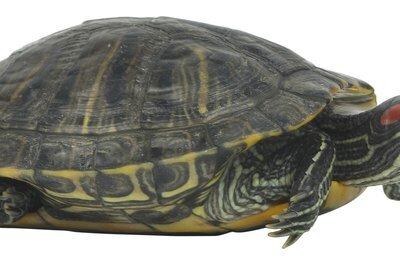 Slider turtles are semi-aquatic and require a swimming area and a basking area. Snappers are among the largest of the commonly kept small pet turtles, reaching up to 20 inches in length. These aggressive turtles are not recommended for first-time turtle owners since, as the name suggests, they like to snap with their mouths. Their strong beaks can break a finger. Snappers need both water and dry land in their habitat. A few exotic types of small turtles are imported into the United States as pets. These include the Reeve's, Asian yellow pond, Asian leaf and African mud turtles. These are larger than mud and musk turtles, but smaller than sliders. They are semi-aquatic and need a habitat large enough to include an area of clean water for swimming and a dry area for basking.